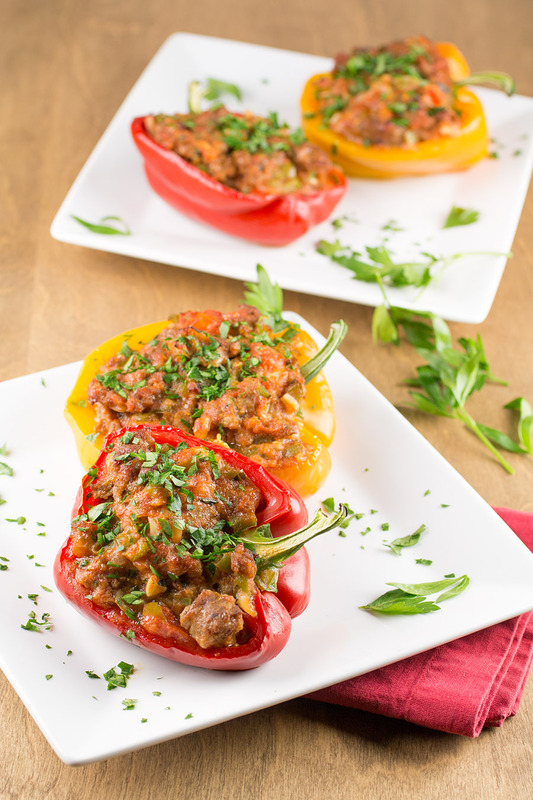 A recipe for flavorful bell peppers that are stuffed with a mixture of Italian sausage, tomato sauce, Parmesan cheese and plenty of seasoning, then baked to perfection. A family favorite. 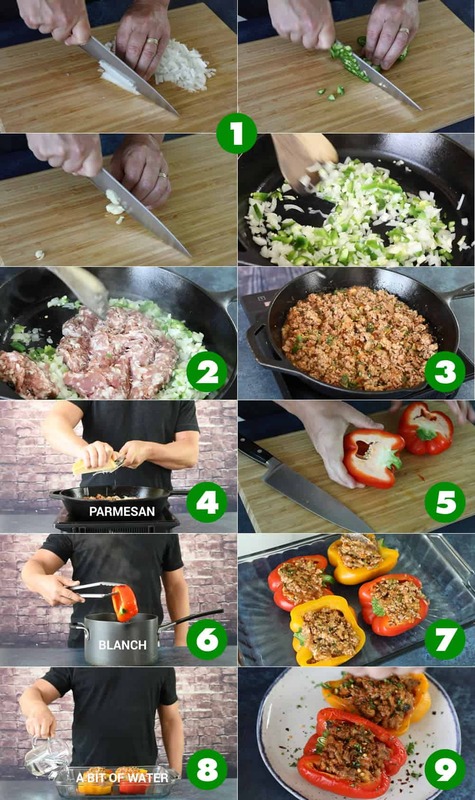 Stuffed peppers are so easy to make! More stuffed peppers coming your way. Of course! 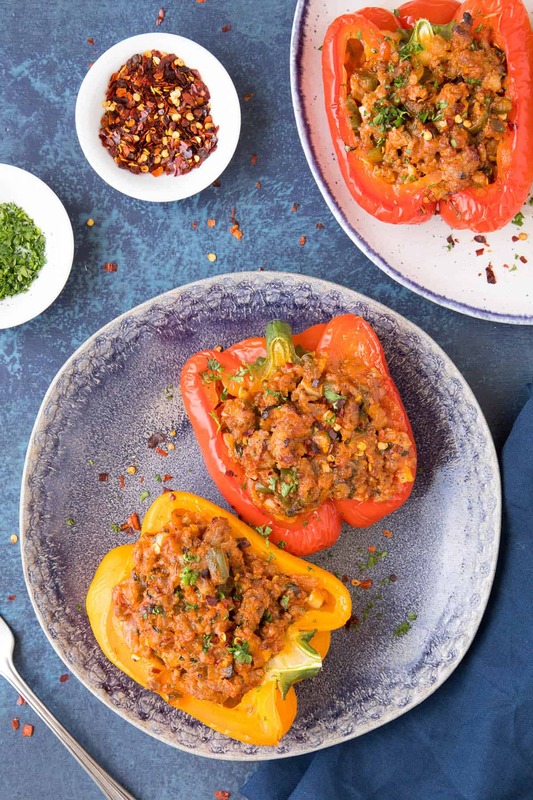 At Chili Pepper Madness, we LOVE cooking with chili peppers, and that means chili peppers of ALL types, and if I’ve said it once, I’ve said it probably ten million times by now – We LOVE stuffed peppers! Chili peppers are the perfect vessels for all sorts of stuffing. I mean, look at them. They’re hollow, right? You slice off the top and peer down into that lonely emptiness and think, this poor little thing needs some company. Or you slice them in half right down the center and you’re left with perfectly formed bowls. All you need to do is get creative. In this case, creative doesn’t have to mean complicated. In fact, it is rather easy. I went with an Italian-style stuffed bell pepper recipe this time, working with some gorgeous red and yellow bells. Green peppers would work just as well here, though I was going for some color. ONE: Chop up some onion, peppers and garlic. I used a jalapeno pepper and serrano pepper this time, though you can vary up the choice of chili peppers to include here based on your tastes and heat preference. More on that below. I have made this with MANY different peppers. TWO: Cook them down in a pan with olive oil about 5 minutes, then add the Italian sausage down, breaking it up with a spoon, another 5 minutes or so, until it is cooked through. THREE: Add in the tomato sauce, basil and seasonings and stir it up to get it all incorporated. Reduce the heat and let it simmer about 10 minutes to let the flavors develop. FOUR: Remove the mixture from the heat and stir in the Parmesan cheese. I used a cup here, though you can easily add in a bit more if you’d like. FIVE: Slice the bell pepper in half lengthwise and scoop out the insides. SIX: Blanch the pepper halves in boiling water for 2-3 minutes to soften them up a bit. 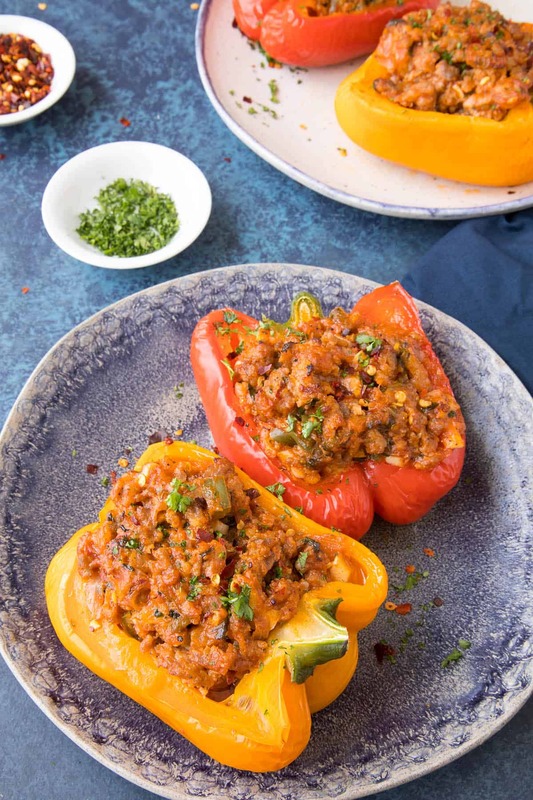 You CAN skip this step if you’d like, but I find that blanching the thicker-walled bell peppers makes for a softer finished stuffed pepper. SEVEN: Set the peppers into a baking dish and stuff them with your Italian sausage mixture. EIGHT: Pour a bit of water into the pan to about 1 inch in height and bake the peppers for 30 minutes, or until the peppers are softened up and cooked through to your liking. NINE: Remove from heat. Sprinkle them with chopped parsley and spicy chili flakes and serve them up! As mentioned, I used a serrano and jalapeno pepper this time for a bit of spicy heat. 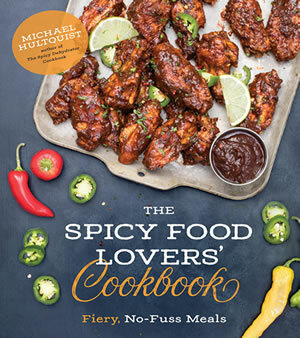 The previous version of this recipe used a jalapeno and an Anaheim pepper. Still great. If you’re looking for a HOTTER version of this recipe, incorporate a habanero pepper or 2, or something hotter, like a ghost pepper or scorpion pepper. Go for the heat! 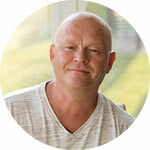 You can also easily dial back the heat by using a milder pepper, such as an Italian sweet or even another bell pepper. This was a nice and hearty meal. Very meaty. 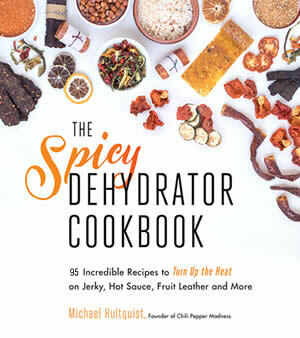 I personally enjoy the red and yellow bells that we use, but I also like that chili pepper heat, so I was glad Mike added the jalapeno pepper. It was perfect. Heat a large pan to medium heat and add a bit of olive oil. Add the onion and peppers and cook about 5 minutes to soften. Add the garlic and stir. Cook another minute. Add the Italian sausage and break it apart with a wooden spoon. Cook it down, stirring a bit, about 5 minutes, or until it is cooked through. Add the paprika, tomato sauce, basil and salt and pepper to taste. Stir. Reduce heat and simmer about 10 minutes or longer. Remove from heat and cool slightly. Stir in Parmesan cheese and mix well. Slice the bell peppers in half lengthwise and scoop out the insides. Bring a large pot of water to boil and boil the halved peppers about 5 minutes to soften. 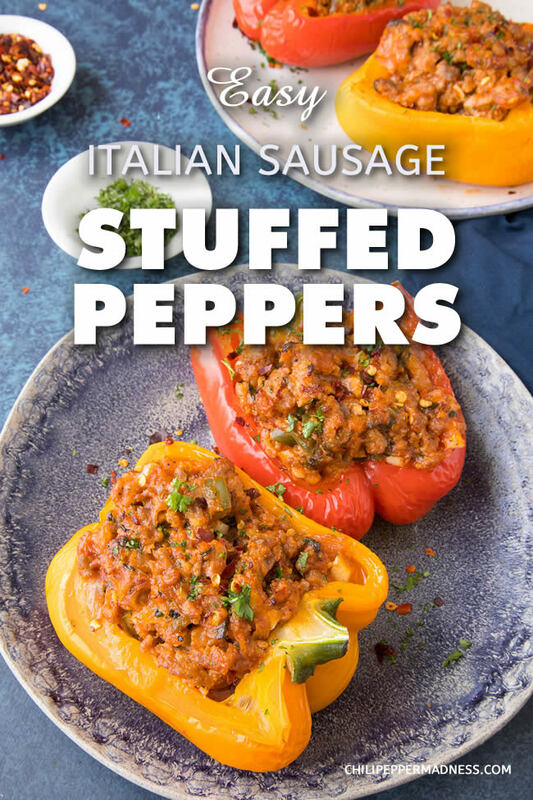 Stuff each pepper with your sausage-cheese mixture and set them into a baking dish. Add about a half inch of water to the baking dish and bake at 350 for about 30 minutes, or until the peppers are softened and the stuffing mixture is nicely heated. You can leave it in longer if needed for even softer peppers. Remove from heat and garnish with parsley and chili pepper flakes. Heat Factor: Medium, though these have a TON of flavor. 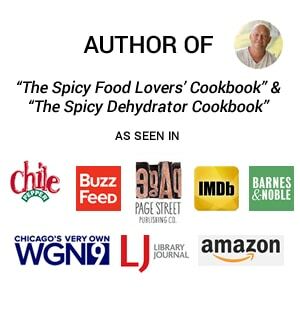 Easily add more heat with spicier chili flakes and/or hot sauce. Recipe originally published on 6/5/2015. UPDATED 6/7/2018. Looks great. Some versions have a tomato sauce included. I tried a version of condensed tomato soup with a touch of water added. Tried this on my family and they liked it.. even my picky little one! It will be a family favourite! That’s GREAT, Nathalie! Super happy to hear! Good recipe, simple to prepare, excellent flavor. I realized early on, my bell peppers must have been twice as large as called for. some truly fine stuffed peppers. Glad it turned out! Thanks for stopping by!